On the way to school, Karin, a junior-high school student, finds a piglet who is too hungry to move. She gives some food to the pig. This pig is actually a prince, Tonrariano III from a planet called Booringo. He gives Karin a transformation kit to reward her kindness. The transformation kit consists of a piggy nose. Karin puts on the nose and says the magical words that Tonrariano III taught her. She then becomes a super-pig, a mighty flying pig, Boorin! But Karin is not happy to be a pig. Tonrariano III discusses it with his father the King, who promises Karin that she can become her ideal super-heroine if she collects 100 pearls, which will be given to her one by one each time Boorin helps somebody. 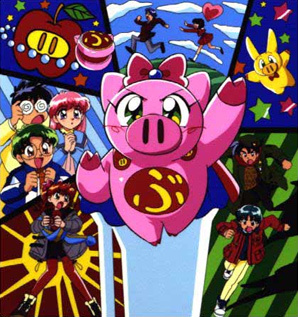 Boorin becomes a mysterious super pig who appears from nowhere when people are in trouble. Although everyone is curious of the pig?s origins, nobody knows that Boorin is really Karin.